During the heyday of the French Music Hall, a time before the live show was subverted by the invention of film, television, and even radio, the Moulin Rouge, named for its distinctive red windmill landmark, was the most famous. Located in the Montmartre district of Paris, the Moulin Rouge first opened its doors in the autumn of 1889 and quickly became a popular destination for live entertainment, as it was known for orchestrating singers, dancers, elaborate sets, and flamboyant costumes into glitzy and grand production numbers. The Moulin Rouge also became synonymous with the Can-Can (which literally means 'tittle-tattle'), a provocative dance that has become indelibly ingrained into the popular consciousness by films such as 1953's "Moulin Rouge" and 1960's "Can-Can". Today, the Moulin Rouge still stands at 82 boulevard de Clichy, and its world-famous cabaret is still a major draw, particularly among tourists. With his newest film "Moulin Rouge", writer/director Baz Luhrmann re-imagines the famous Parisian nightspot, circa 1899, as a larger-than-life house of decadence and debauchery, where 'the rich and powerful come to play with the young and beautiful'. Much like Luhrmann's previous effort, "Romeo + Juliet", "Moulin Rouge" is set in an alternate universe where the historical trappings of the narrative peacefully coexist with the anachronistic insertions of today's popular culture. Though such a mish-mash of contrasts may initially be unnerving to some viewers (particularly in light of the recent "A Knight's Tale"), "Moulin Rouge" works remarkably well, due in part to its playful tone, gaudy visuals, memorable music, and the solid chemistry between its two romantic leads. 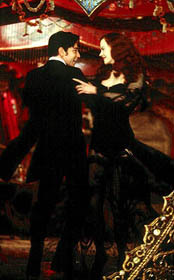 The story of "Moulin Rouge" revolves around two star-crossed lovers, Christian (Ewan McGregor of "Star Wars Episode I: The Phantom Menace") and Satine (Nicole Kidman of "Eyes Wide Shut"). Christian is a penniless writer who has come to Paris to write about 'truth, beauty, freedom, and most of all, love', and ends up hooking up with a group of like-minded bohemian artists, who are in the midst of writing a musical called "Spectacular Spectacular". The leader of the group, dwarf Toulouse Lautrec (John Leguizamo of "Romeo + Juliet"), playing a real-life figure whose sketches of the Moulin Rouge are world-renowned), sees great potential in Christian, and asks him to attend a 'pitch session' with the star of the Moulin Rouge, Satine. Meanwhile, Satine and the owner of the Moulin Rouge (Jim Broadbent, seen recently in "Bridget Jones's Diary") are in the midst of wooing the well-heeled Duke of Worcester (Richard Roxburgh of "Mission: Impossible II") into investing in the Moulin Rouge. By sleeping with the Duke, Satine will seal a deal that will transform the Moulin Rouge into a legitimate theatre and make Satine a real actress. However, a comedy of errors ensues as Satine mistakes Christian for the Duke, and she finds herself swayed by the eloquent words of the poor wordsmith. Thus, Satine finds herself in a quandary, as she must choose between the penniless writer, whom she loves, and the wealthy Duke, whose finances will make her a star and ensure a future for the Moulin Rouge. What then follows should be very familiar to fans of "Shakespeare in Love"-- Christian begins writing a musical set in India, with Satine as the star, about a love triangle between a poor musician, a courtesan, and an evil Maharaj that parallels his own experience. As the script for the lavish production unfolds, so does the Christian-Satine-Duke romantic entanglement, with both story threads ultimately being resolved on the stage. And in the process, both Christian and Satine learn that the pursuit of 'truth, beauty, freedom, and most of all, love' can exact a heavy price. 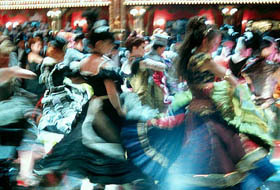 There is no modesty to be found in "Moulin Rouge", as Luhrmann has taken everything to the extreme in this production. The set pieces are larger-than-life and ostentatious to the hilt, making turn-of-the-century Paris look like something conceived from equal parts of Tim Burton ("Batman") and Dr. Seuss by way of Las Vegas. The hallucinogenic cinematography, incorporating quick edits, garish colors, and plenty of overblown spectacle is sure to induce sensory overload, falling just short of inducing seizures in susceptible individuals. Luhrmann, whose background prior to film includes extensive work in stage work and opera, certainly knows how to put on a show with style. But what has generated the most buzz about "Moulin Rouge" are the musical numbers. Like the Hollywood musicals of old, this is a film where characters spontaneously burst out in song at the drop of a hat, to the tune of full orchestral accompaniment. However, in the case of "Moulin Rouge", the words they sing are culled from a 'who's who' of pop music from the Twentieth Century, which are seamlessly combined in new and exciting ways. 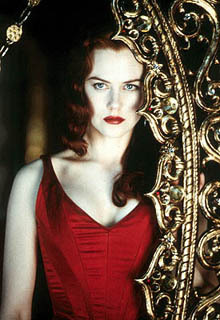 The most memorable would include Satine's introductory number where she warbles a rousing rendition of "Diamonds are a Girl's Best Friend" that lapses into "Material Girl", Christian's declaration of love to Satine by way of Elton John's "Your Song", and a funky production number from "Spectacular Spectacular" that combines a techno beat and Hindi vocals. Even when the musical numbers don't quite work , such as a bizarre rendition of "Like A Virgin" shared by Broadbent and Roxburgh, they still possess a giddy tongue-in-cheek charm. As for the execution of the musical numbers themselves, no expense is spared in creating these marvels of sight and sound, with hundreds of singers and dancers being choreographed at a time, or the use of CGI to enhance a dance amidst the clouds between Christian and Satine. Of course, all the eye candy and pop songs in the world would not make for a good film unless there was a strong emotional undercurrent. Luhrmann is no slouch here either, as the garish excesses of the film gradually give way to reveal the central romance, which is both touching, and in the end, devastating. The chemistry between McGregor and Kidman is unsurpassed, as the former portrays Christian as a naïve yet earnest romantic (the hopeless kind), while the latter positively sizzles as a showgirl whose glamorous exterior hides a heart of pure gold. Both actors also sing their own songs, heightening the credibility of their shared musical numbers, where much of the magic between their characters is created. Though Luhrmann does occasionally go a little too over-the-top, such as in his penchant for speeding up the film or injecting slapstick into the proceedings, these transgressions are slight in comparison to the multimedia celluloid fantasy he has created, which I consider a worthy successor to the old-school Hollywood musical. "Moulin Rouge" is a grand, visually-stunning, and 'spectacular spectacular' spectacle that knows how to please the eyes and ears, as well as touch the heart. In combining the old with the new, Luhrmann has fashioned a dazzling eruption of sight and sound, a 'popera' that will surely be one of the most daring and imaginative films to grace the silver screen this year. Images courtesy of Twentieth Century Fox. All rights reserved.